Heavy Duty 18oz Steel Tarp is available in size 24' x 18'. The fabric of this steel tarp is made of Made with Heavy Duty 18 Oz. Vinyl. Heat-sealed seams make the tarps 100% waterproof. Tough solid toothed brass grommets clinched every 2 Feet. Three rows of "D" Rings box stitched with protection flaps so the hooks from bungee straps don't damage the tarp. 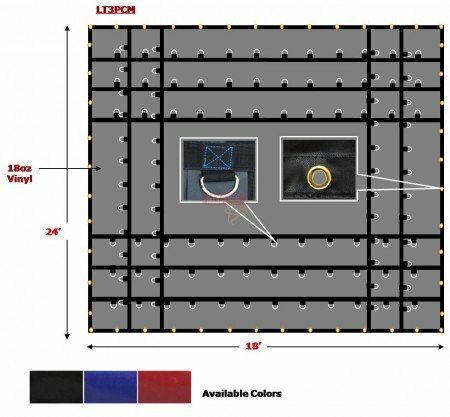 Heavy Duty 18oz Steel Tarp available in black, blue and red color.